Our completely renovated hotel is ready to accommodate all our visitors and guests and we welcome you. The Marin Dream Hotel in Heraklion City provides an ideal choice for tourists and business travellers. We are only steps away from the cruise lines and the vibrant city center of Heraklion. The magnificent view of the harbour and the famous fortress of Koule impresses all who have the privilege to enjoy from one of our fine rooms of from our beautiful Gazzebo Restaurant where you will be treated to a complimentary breakfast or casual meal or snack throughout the day. 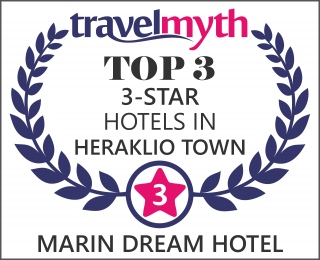 The relaxed environment and friendly atmosphere prevails in combination with the accessible prices throughout the year makes the MARIN DREAM HOTEL really... a dream of a choice for your stay in Heraklion. The MARIN DREAM HOTEL with long-lasting experience and expertise in traditional in hospitality was renovated radically the summer of 2005. The transformed property now provides comforts and services that correspond in the requirements of our seasons and the needs of our guests. It belongs in luxurious category and stays open all the year. With easy access and small distance from all city sightseeing you might want to pass many days in a space of the discreet luxury and comfort offered by the MARIN DREAM HOTEL in the city of Heraklion.